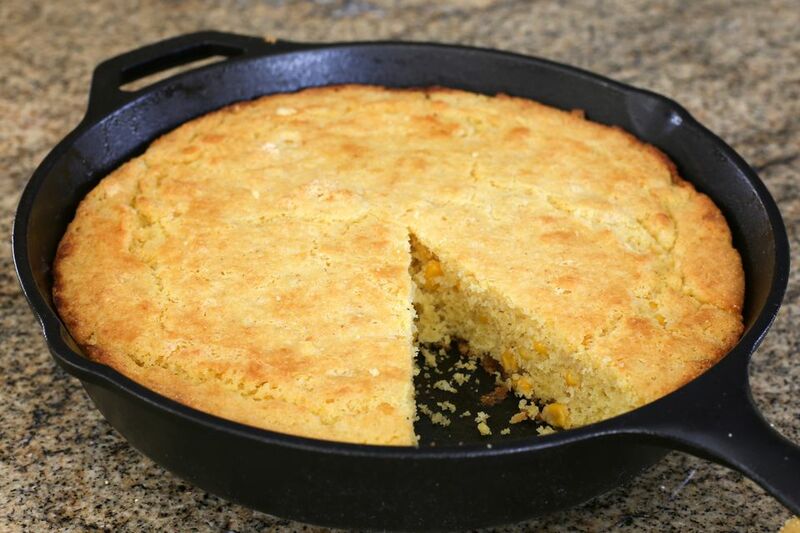 This is a delicious, buttery cornbread made with the addition of corn kernels. The corn adds texture and flavor to this Southern-style cornbread. There's little or no salt in this version, which is the Southern preference. If you like a sweet cornbread, add about 1/4 cup of sugar to the batter. This is an excellent choice for any meal, and especially appropriate for a New Year's Day dinner. The corn in the bread is said to symbolize gold nuggets in the "gold" cornbread. This cornbread is the perfect bread for a meal of beans or peas, or bake it to serve with chili or greens. Heat the oven to 400 F. Place a cast iron skillet in the oven to heat for 10 minutes. In a large bowl, combine the cornmeal, flour, sugar, if using, baking powder, salt, and soda. Whisk to blend ingredients thoroughly. Stir in the corn kernels. In another bowl, whisk the buttermilk and eggs together until well blended. Whisk in 4 tablespoons of the melted butter. Carefully take the hot skillet out of the oven and set it on a rack. Add the remaining 2 tablespoons of butter to the skillet. Swirl the pan slightly to cover the bottom with the butter. Combine the dry ingredients with the buttermilk mixture until blended. Pour the batter into the pan and return the pan to the oven. Bake the cornbread for 23 to 26 minutes, or until it is golden brown and crusty along the sides.